It is possible make any Program, App or File to start automatically with your computer. 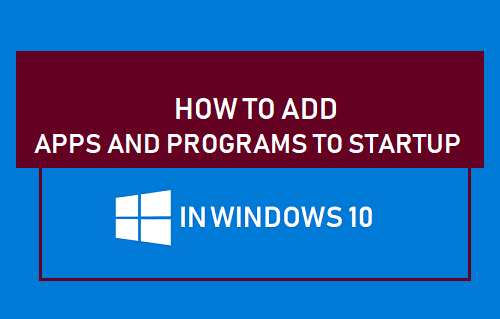 You will find below the steps to Add Apps and Programs to Startup in Windows 10. The main reason for making an App, Desktop Program or File to Startup with the computer would be to make the Program or File to load up and become readily available for your use. 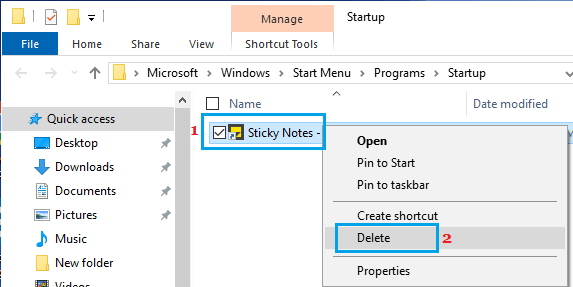 For example, if the first thing that you do on your computer is to check Mail and List of things to do, you can make the Mail App and the Sticky Notes Apps to Startup with your computer. Similarly, if you are likely to work most of the times on a particular Microsoft Excel File, you can make this File to open with your computer by adding it to Startup in Windows 10. 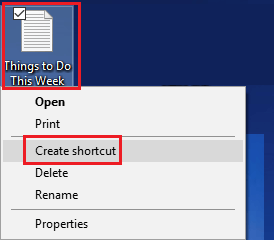 All that is required to make any App, Program or File to Startup with the computer is to create a shortcut to the Program or File and add the Shortcut to the Startup Folder on your computer. Follow the steps below to Add any modern App or desktop Program to Startup in Windows 10. 1. Right-click on the Start button and click on Run. Note: You can also open Run Command by using Win+R keyboard shortcut. 2. 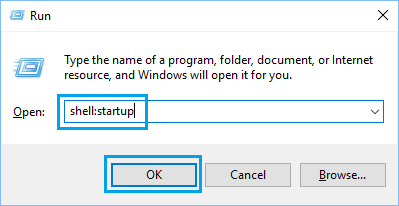 In the Run Command window, type shell:startup and click on OK to open the Startup Folder on your computer. 3. Next, open Run Command again > type shell:appsfolder and click on OK to open the modern Apps folder on your computer. 4. In the Apps Folder, locate the App that you want to Startup with your computer and drag it to the Startup Folder. From now on, whenever you turn ON the computer, the App or Program that you had added to the Startup Folder will be open and available for your use. The procedure to Add any Excel, Word or any other File to Startup in Windows 10 is the same as adding Apps and Programs to startup in Windows 10. 1. Right-click on the File and click on Create Shortcut option in the contextual menu. 2. 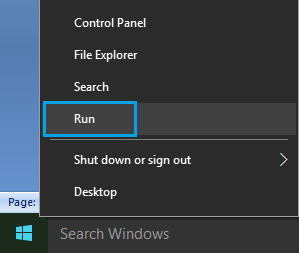 Next, open the Run command > type shell:startup and click on OK to open the Startup Folder. 3. Now, drag the Shortcut that you had created into the Startup Folder. Note: You can also use Copy/Paste or Cut/Paste commands to copy the shortcut into the Startup Folder. 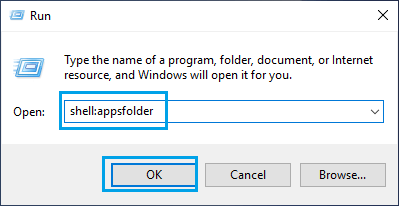 At any time, you can remove the App or Program from Startup Folder and this will prevent the Program from starting automatically with your computer. 1. Open Run Command > type shell:startup and click on OK to open the Startup Folder on your computer. 2. In the Startup Folder, right-click on the Program and click on Delete to remove the program from Startup Folder.